Opened on 1st November 1876, the 14-mile Wye Valley Railway crossed the river three times - at Monmouth, Tintern and at Penallt / Redbrook. The latter involved a single-track curved structure of five girder spans, perched on four pairs of cast iron columns. The Penallt Viaduct carried the line for around 300 feet over the England/Wales border between Redbrook Station (Gloucestershire) - noted for its floral displays - and Penallt Halt (Monmouthshire) which opened in 1931 to serve the nearby Penallt village. The Boat Inn sits in the viaduct's shadow. In 1955, a footbridge was added on the west side, of the viaduct offering pedestrians a safe alternative to crossing the river rather than walking along the railway. Four years later, passenger services came to an end and January 6th, 1964 freight services ceased on the Wye Valley line north of Tidenham. The bridge is in need of significant repairs and has been the subject of a recent, but unsuccessful bit for National Lottery Funding. 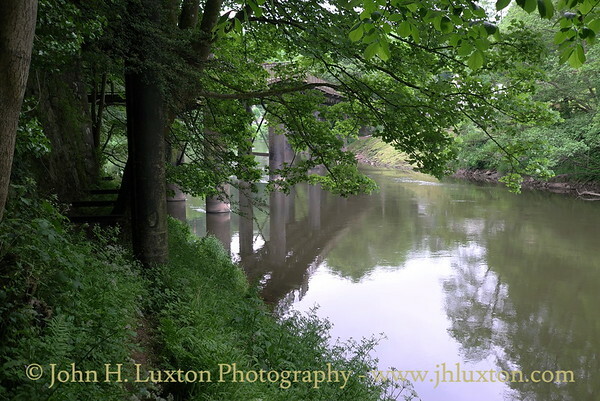 Reflection of Penallt Viaduct from the English / Gloucestershire side of the River Wye. 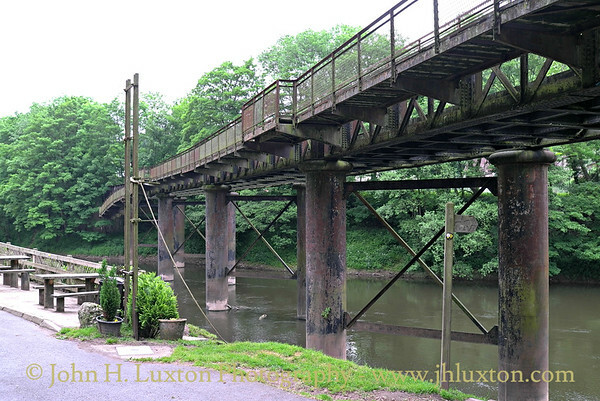 Opened on 1st November 1876, the 14-mile Wye Valley Railway crossed the river three times - at Monmouth, Tintern and at Penallt / Redbrook. 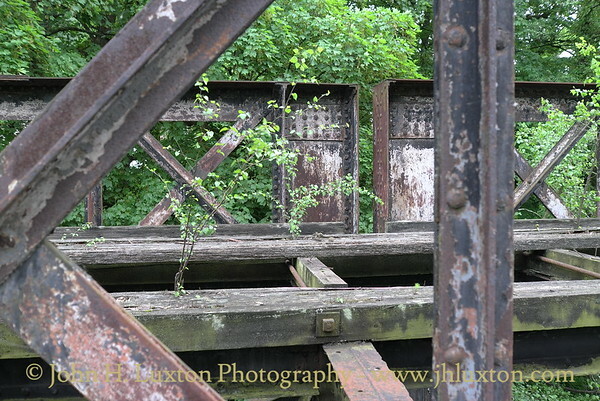 The latter involved a single-track curved structure of five girder spans, perched on four pairs of cast iron columns. The Penallt Viaduct carried the line for around 300 feet over the England/Wales border between Redbrook Station (Gloucestershire) - noted for its floral displays - and Penallt Halt (Monmouthshire) which opened in 1931 to serve the nearby Penallt village. The Boat Inn sits in the viaduct's shadow. In 1955, a footbridge was added on the west side, of the viaduct offering pedestrians a safe alternative to crossing the river rather than walking along the railway. Four years later, passenger services came to an end and January 6th, 1964 freight services ceased on the Wye Valley line north of Tidenham. The bridge is in need of significant repairs and has been the subject of a recent, but unsuccessful, bid for National Lottery Funding. 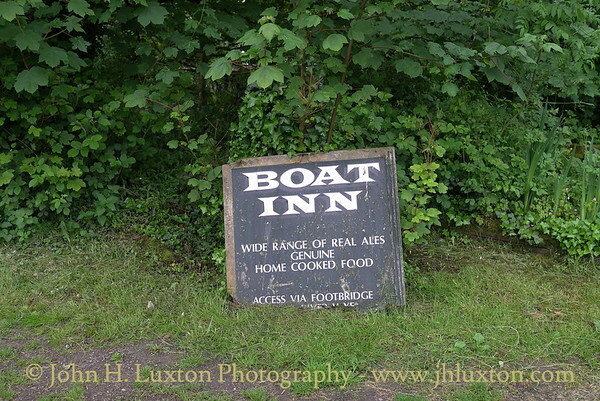 A sign near the Redbrook Car Park / Recreation ground partially constructed on the site of the former Redbrook Railway Station Goods Yard directs potential patrons to the Boat Inn across the river at Penallt. Opened on 1st November 1876, the 14-mile Wye Valley Railway crossed the river three times - at Monmouth, Tintern and at Penallt / Redbrook. The latter involved a single-track curved structure of five girder spans, perched on four pairs of cast iron columns. The Penallt Viaduct carried the line for around 300 feet over the England/Wales border between Redbrook Station (Gloucestershire) - noted for its floral displays - and Penallt Halt (Monmouthshire) which opened in 1931 to serve the nearby Penallt village. The Boat Inn sits in the viaduct's shadow. In 1955, a footbridge was added on the west side, of the viaduct offering pedestrians a safe alternative to crossing the river rather than walking along the railway. Four years later, passenger services came to an end and January 6th, 1964 freight services ceased on the Wye Valley line north of Tidenham. The bridge is in need of significant repairs and has been the subject of a recent, but unsuccessful, bid for National Lottery Funding. 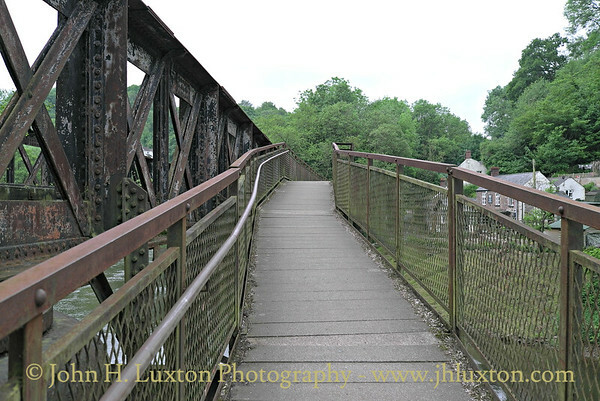 The foot bridge passes under the railway track to reach the west side of the bridge. Opened on 1st November 1876, the 14-mile Wye Valley Railway crossed the river three times - at Monmouth, Tintern and at Penallt / Redbrook. The latter involved a single-track curved structure of five girder spans, perched on four pairs of cast iron columns. The Penallt Viaduct carried the line for around 300 feet over the England/Wales border between Redbrook Station (Gloucestershire) - noted for its floral displays - and Penallt Halt (Monmouthshire) which opened in 1931 to serve the nearby Penallt village. The Boat Inn sits in the viaduct's shadow. In 1955, a footbridge was added on the west side, of the viaduct offering pedestrians a safe alternative to crossing the river rather than walking along the railway. Four years later, passenger services came to an end and January 6th, 1964 freight services ceased on the Wye Valley line north of Tidenham. The bridge is in need of significant repairs and has been the subject of a recent, but unsuccessful, bid for National Lottery Funding. 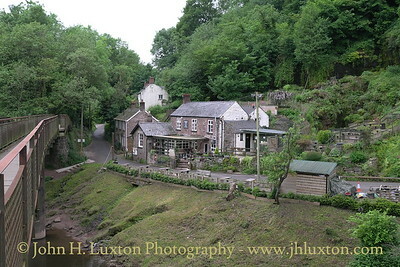 View from the Penallt Viaduct to the Boat Inn. Opened on 1st November 1876, the 14-mile Wye Valley Railway crossed the river three times - at Monmouth, Tintern and at Penallt / Redbrook. 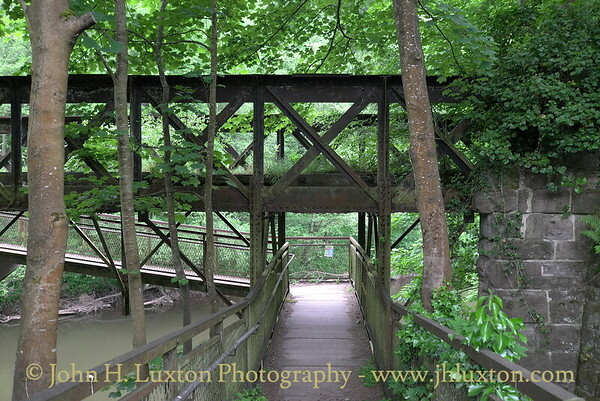 The latter involved a single-track curved structure of five girder spans, perched on four pairs of cast iron columns. The Penallt Viaduct carried the line for around 300 feet over the England/Wales border between Redbrook Station (Gloucestershire) - noted for its floral displays - and Penallt Halt (Monmouthshire) which opened in 1931 to serve the nearby Penallt village. The Boat Inn sits in the viaduct's shadow. In 1955, a footbridge was added on the west side, of the viaduct offering pedestrians a safe alternative to crossing the river rather than walking along the railway. Four years later, passenger services came to an end and January 6th, 1964 freight services ceased on the Wye Valley line north of Tidenham. The bridge is in need of significant repairs and has been the subject of a recent, but unsuccessful, bid for National Lottery Funding. View from the footpath which for much of its length is at the same height as the railway. 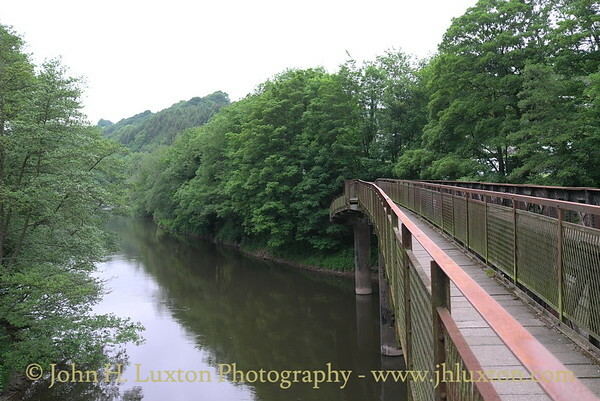 View up river towards Monmouth. Opened on 1st November 1876, the 14-mile Wye Valley Railway crossed the river three times - at Monmouth, Tintern and at Penallt / Redbrook. 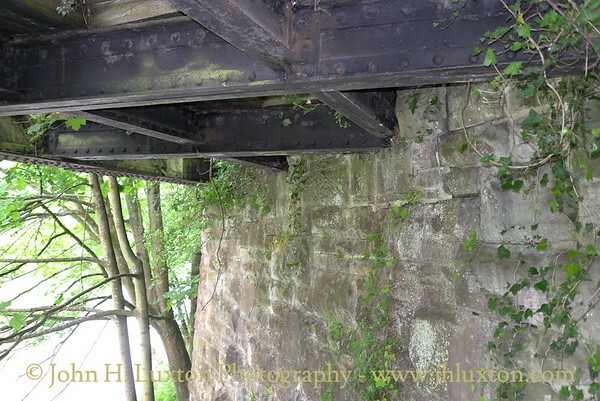 The latter involved a single-track curved structure of five girder spans, perched on four pairs of cast iron columns. The Penallt Viaduct carried the line for around 300 feet over the England/Wales border between Redbrook Station (Gloucestershire) - noted for its floral displays - and Penallt Halt (Monmouthshire) which opened in 1931 to serve the nearby Penallt village. The Boat Inn sits in the viaduct's shadow. In 1955, a footbridge was added on the west side, of the viaduct offering pedestrians a safe alternative to crossing the river rather than walking along the railway. Four years later, passenger services came to an end and January 6th, 1964 freight services ceased on the Wye Valley line north of Tidenham. The bridge is in need of significant repairs and has been the subject of a recent, but unsuccessful, bid for National Lottery Funding. 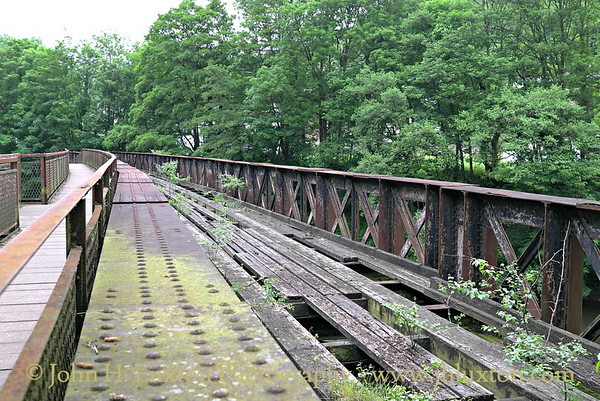 The railway decking still exists in places presumably if the bridge could be properly restored the foot path could be relocated to the railway space? Opened on 1st November 1876, the 14-mile Wye Valley Railway crossed the river three times - at Monmouth, Tintern and at Penallt / Redbrook. The latter involved a single-track curved structure of five girder spans, perched on four pairs of cast iron columns. The Penallt Viaduct carried the line for around 300 feet over the England/Wales border between Redbrook Station (Gloucestershire) - noted for its floral displays - and Penallt Halt (Monmouthshire) which opened in 1931 to serve the nearby Penallt village. The Boat Inn sits in the viaduct's shadow. In 1955, a footbridge was added on the west side, of the viaduct offering pedestrians a safe alternative to crossing the river rather than walking along the railway. Four years later, passenger services came to an end and January 6th, 1964 freight services ceased on the Wye Valley line north of Tidenham. The bridge is in need of significant repairs and has been the subject of a recent, but unsuccessful, bid for National Lottery Funding. Opened on 1st November 1876, the 14-mile Wye Valley Railway crossed the river three times - at Monmouth, Tintern and at Penallt / Redbrook. The latter involved a single-track curved structure of five girder spans, perched on four pairs of cast iron columns. The Penallt Viaduct carried the line for around 300 feet over the England/Wales border between Redbrook Station (Gloucestershire) - noted for its floral displays - and Penallt Halt (Monmouthshire) which opened in 1931 to serve the nearby Penallt village. The Boat Inn sits in the viaduct's shadow. 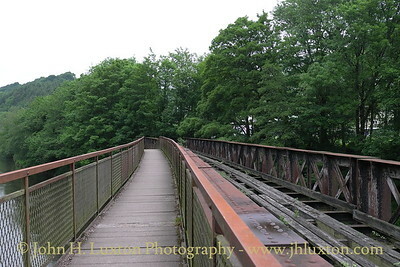 In 1955, a footbridge was added on the west side, of the viaduct offering pedestrians a safe alternative to crossing the river rather than walking along the railway. Four years later, passenger services came to an end and January 6th, 1964 freight services ceased on the Wye Valley line north of Tidenham. The bridge is in need of significant repairs and has been the subject of a recent, but unsuccessful, bid for National Lottery Funding. View towards the Gloucestershire side of the river. Penallt Halt was located towards the top right of the photograph. Opened on 1st November 1876, the 14-mile Wye Valley Railway crossed the river three times - at Monmouth, Tintern and at Penallt / Redbrook. The latter involved a single-track curved structure of five girder spans, perched on four pairs of cast iron columns. The Penallt Viaduct carried the line for around 300 feet over the England/Wales border between Redbrook Station (Gloucestershire) - noted for its floral displays - and Penallt Halt (Monmouthshire) which opened in 1931 to serve the nearby Penallt village. The Boat Inn sits in the viaduct's shadow. In 1955, a footbridge was added on the west side, of the viaduct offering pedestrians a safe alternative to crossing the river rather than walking along the railway. Four years later, passenger services came to an end and January 6th, 1964 freight services ceased on the Wye Valley line north of Tidenham. The bridge is in need of significant repairs and has been the subject of a recent, but unsuccessful, bid for National Lottery Funding. 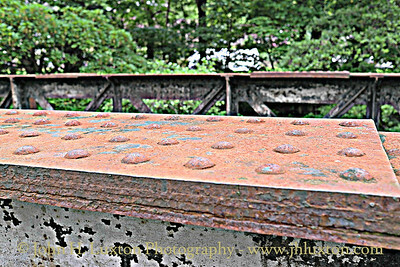 As can be seen here ther viaduct certainly needs some paint! Opened on 1st November 1876, the 14-mile Wye Valley Railway crossed the river three times - at Monmouth, Tintern and at Penallt / Redbrook. The latter involved a single-track curved structure of five girder spans, perched on four pairs of cast iron columns. The Penallt Viaduct carried the line for around 300 feet over the England/Wales border between Redbrook Station (Gloucestershire) - noted for its floral displays - and Penallt Halt (Monmouthshire) which opened in 1931 to serve the nearby Penallt village. The Boat Inn sits in the viaduct's shadow. In 1955, a footbridge was added on the west side, of the viaduct offering pedestrians a safe alternative to crossing the river rather than walking along the railway. Four years later, passenger services came to an end and January 6th, 1964 freight services ceased on the Wye Valley line north of Tidenham. The bridge is in need of significant repairs and has been the subject of a recent, but unsuccessful, bid for National Lottery Funding. View up the access ramp leading to the pedestrian walkway. Opened on 1st November 1876, the 14-mile Wye Valley Railway crossed the river three times - at Monmouth, Tintern and at Penallt / Redbrook. The latter involved a single-track curved structure of five girder spans, perched on four pairs of cast iron columns. The Penallt Viaduct carried the line for around 300 feet over the England/Wales border between Redbrook Station (Gloucestershire) - noted for its floral displays - and Penallt Halt (Monmouthshire) which opened in 1931 to serve the nearby Penallt village. The Boat Inn sits in the viaduct's shadow. In 1955, a footbridge was added on the west side, of the viaduct offering pedestrians a safe alternative to crossing the river rather than walking along the railway. Four years later, passenger services came to an end and January 6th, 1964 freight services ceased on the Wye Valley line north of Tidenham. The bridge is in need of significant repairs and has been the subject of a recent, but unsuccessful, bid for National Lottery Funding. 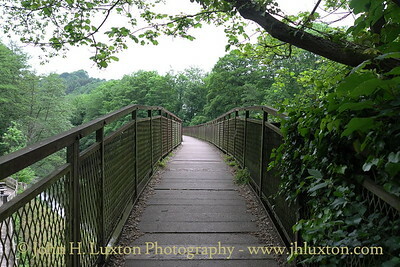 The footpath decking is made up of concrete paving strips. Opened on 1st November 1876, the 14-mile Wye Valley Railway crossed the river three times - at Monmouth, Tintern and at Penallt / Redbrook. 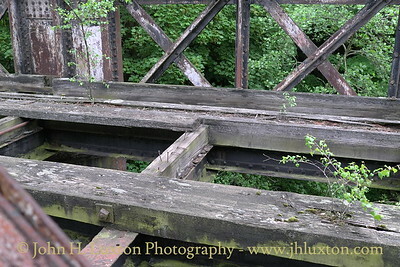 The latter involved a single-track curved structure of five girder spans, perched on four pairs of cast iron columns. The Penallt Viaduct carried the line for around 300 feet over the England/Wales border between Redbrook Station (Gloucestershire) - noted for its floral displays - and Penallt Halt (Monmouthshire) which opened in 1931 to serve the nearby Penallt village. The Boat Inn sits in the viaduct's shadow. In 1955, a footbridge was added on the west side, of the viaduct offering pedestrians a safe alternative to crossing the river rather than walking along the railway. Four years later, passenger services came to an end and January 6th, 1964 freight services ceased on the Wye Valley line north of Tidenham. The bridge is in need of significant repairs and has been the subject of a recent, but unsuccessful, bid for National Lottery Funding. 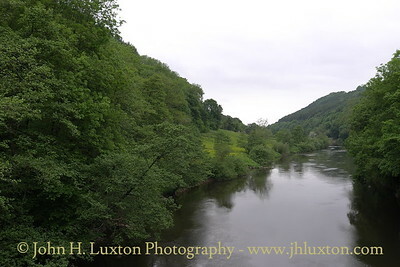 View back to the Redbrook side of the River Wye. Opened on 1st November 1876, the 14-mile Wye Valley Railway crossed the river three times - at Monmouth, Tintern and at Penallt / Redbrook. The latter involved a single-track curved structure of five girder spans, perched on four pairs of cast iron columns. The Penallt Viaduct carried the line for around 300 feet over the England/Wales border between Redbrook Station (Gloucestershire) - noted for its floral displays - and Penallt Halt (Monmouthshire) which opened in 1931 to serve the nearby Penallt village. The Boat Inn sits in the viaduct's shadow. In 1955, a footbridge was added on the west side, of the viaduct offering pedestrians a safe alternative to crossing the river rather than walking along the railway. Four years later, passenger services came to an end and January 6th, 1964 freight services ceased on the Wye Valley line north of Tidenham. The bridge is in need of significant repairs and has been the subject of a recent, but unsuccessful, bid for National Lottery Funding. View up the Wye Valley towards Monmouth. Opened on 1st November 1876, the 14-mile Wye Valley Railway crossed the river three times - at Monmouth, Tintern and at Penallt / Redbrook. 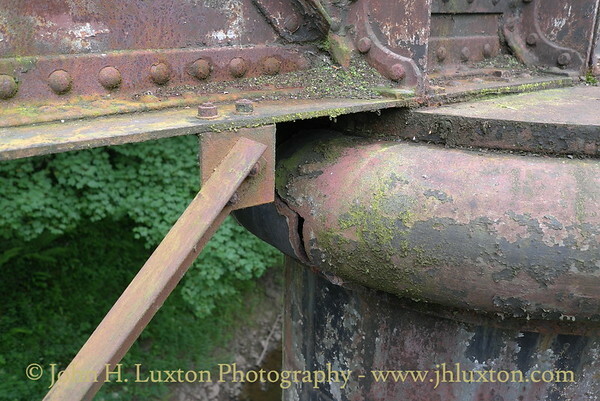 The latter involved a single-track curved structure of five girder spans, perched on four pairs of cast iron columns. The Penallt Viaduct carried the line for around 300 feet over the England/Wales border between Redbrook Station (Gloucestershire) - noted for its floral displays - and Penallt Halt (Monmouthshire) which opened in 1931 to serve the nearby Penallt village. The Boat Inn sits in the viaduct's shadow. In 1955, a footbridge was added on the west side, of the viaduct offering pedestrians a safe alternative to crossing the river rather than walking along the railway. Four years later, passenger services came to an end and January 6th, 1964 freight services ceased on the Wye Valley line north of Tidenham. The bridge is in need of significant repairs and has been the subject of a recent, but unsuccessful, bid for National Lottery Funding. 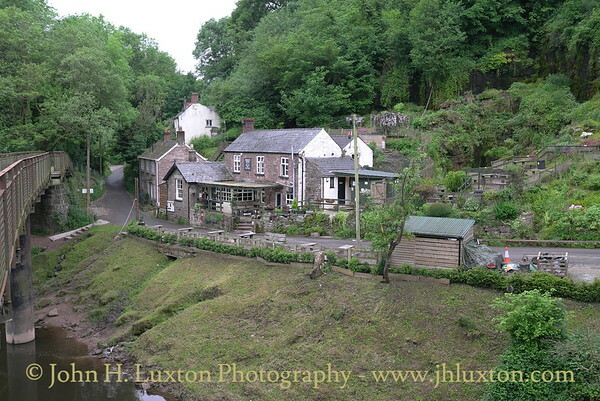 Another view of the Boat Inn at Penallt. Opened on 1st November 1876, the 14-mile Wye Valley Railway crossed the river three times - at Monmouth, Tintern and at Penallt / Redbrook. The latter involved a single-track curved structure of five girder spans, perched on four pairs of cast iron columns. The Penallt Viaduct carried the line for around 300 feet over the England/Wales border between Redbrook Station (Gloucestershire) - noted for its floral displays - and Penallt Halt (Monmouthshire) which opened in 1931 to serve the nearby Penallt village. The Boat Inn sits in the viaduct's shadow. In 1955, a footbridge was added on the west side, of the viaduct offering pedestrians a safe alternative to crossing the river rather than walking along the railway. Four years later, passenger services came to an end and January 6th, 1964 freight services ceased on the Wye Valley line north of Tidenham. The bridge is in need of significant repairs and has been the subject of a recent, but unsuccessful, bid for National Lottery Funding. Rust! Opened on 1st November 1876, the 14-mile Wye Valley Railway crossed the river three times - at Monmouth, Tintern and at Penallt / Redbrook. The latter involved a single-track curved structure of five girder spans, perched on four pairs of cast iron columns. The Penallt Viaduct carried the line for around 300 feet over the England/Wales border between Redbrook Station (Gloucestershire) - noted for its floral displays - and Penallt Halt (Monmouthshire) which opened in 1931 to serve the nearby Penallt village. The Boat Inn sits in the viaduct's shadow. In 1955, a footbridge was added on the west side, of the viaduct offering pedestrians a safe alternative to crossing the river rather than walking along the railway. Four years later, passenger services came to an end and January 6th, 1964 freight services ceased on the Wye Valley line north of Tidenham. The bridge is in need of significant repairs and has been the subject of a recent, but unsuccessful, bid for National Lottery Funding. 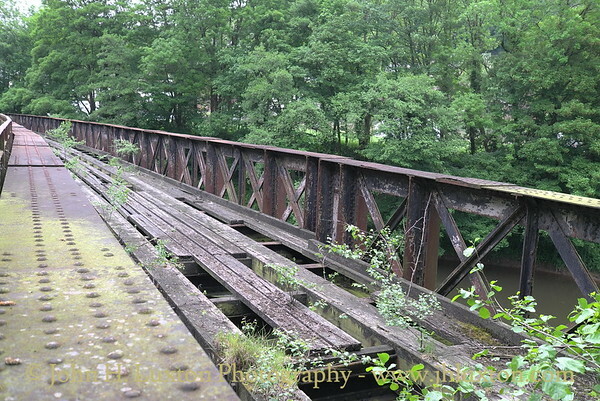 Remains of the railway decking. Opened on 1st November 1876, the 14-mile Wye Valley Railway crossed the river three times - at Monmouth, Tintern and at Penallt / Redbrook. The latter involved a single-track curved structure of five girder spans, perched on four pairs of cast iron columns. The Penallt Viaduct carried the line for around 300 feet over the England/Wales border between Redbrook Station (Gloucestershire) - noted for its floral displays - and Penallt Halt (Monmouthshire) which opened in 1931 to serve the nearby Penallt village. The Boat Inn sits in the viaduct's shadow. In 1955, a footbridge was added on the west side, of the viaduct offering pedestrians a safe alternative to crossing the river rather than walking along the railway. Four years later, passenger services came to an end and January 6th, 1964 freight services ceased on the Wye Valley line north of Tidenham. The bridge is in need of significant repairs and has been the subject of a recent, but unsuccessful, bid for National Lottery Funding. View across the railway deck. Opened on 1st November 1876, the 14-mile Wye Valley Railway crossed the river three times - at Monmouth, Tintern and at Penallt / Redbrook. The latter involved a single-track curved structure of five girder spans, perched on four pairs of cast iron columns. The Penallt Viaduct carried the line for around 300 feet over the England/Wales border between Redbrook Station (Gloucestershire) - noted for its floral displays - and Penallt Halt (Monmouthshire) which opened in 1931 to serve the nearby Penallt village. The Boat Inn sits in the viaduct's shadow. In 1955, a footbridge was added on the west side, of the viaduct offering pedestrians a safe alternative to crossing the river rather than walking along the railway. Four years later, passenger services came to an end and January 6th, 1964 freight services ceased on the Wye Valley line north of Tidenham. The bridge is in need of significant repairs and has been the subject of a recent, but unsuccessful, bid for National Lottery Funding. An ominous crack in one of the tops of the cast iron support piers. Opened on 1st November 1876, the 14-mile Wye Valley Railway crossed the river three times - at Monmouth, Tintern and at Penallt / Redbrook. The latter involved a single-track curved structure of five girder spans, perched on four pairs of cast iron columns. The Penallt Viaduct carried the line for around 300 feet over the England/Wales border between Redbrook Station (Gloucestershire) - noted for its floral displays - and Penallt Halt (Monmouthshire) which opened in 1931 to serve the nearby Penallt village. The Boat Inn sits in the viaduct's shadow. In 1955, a footbridge was added on the west side, of the viaduct offering pedestrians a safe alternative to crossing the river rather than walking along the railway. Four years later, passenger services came to an end and January 6th, 1964 freight services ceased on the Wye Valley line north of Tidenham. The bridge is in need of significant repairs and has been the subject of a recent, but unsuccessful, bid for National Lottery Funding. 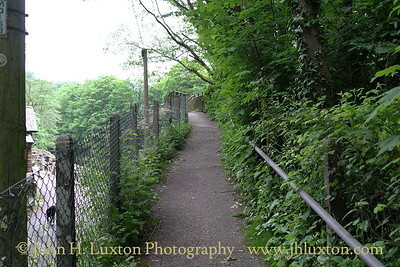 Descending to the underpass on the Gloucestershire - Redbrook side of the River Wye. 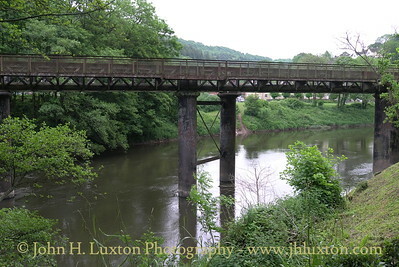 Opened on 1st November 1876, the 14-mile Wye Valley Railway crossed the river three times - at Monmouth, Tintern and at Penallt / Redbrook. The latter involved a single-track curved structure of five girder spans, perched on four pairs of cast iron columns. The Penallt Viaduct carried the line for around 300 feet over the England/Wales border between Redbrook Station (Gloucestershire) - noted for its floral displays - and Penallt Halt (Monmouthshire) which opened in 1931 to serve the nearby Penallt village. The Boat Inn sits in the viaduct's shadow. In 1955, a footbridge was added on the west side, of the viaduct offering pedestrians a safe alternative to crossing the river rather than walking along the railway. Four years later, passenger services came to an end and January 6th, 1964 freight services ceased on the Wye Valley line north of Tidenham. The bridge is in need of significant repairs and has been the subject of a recent, but unsuccessful, bid for National Lottery Funding. 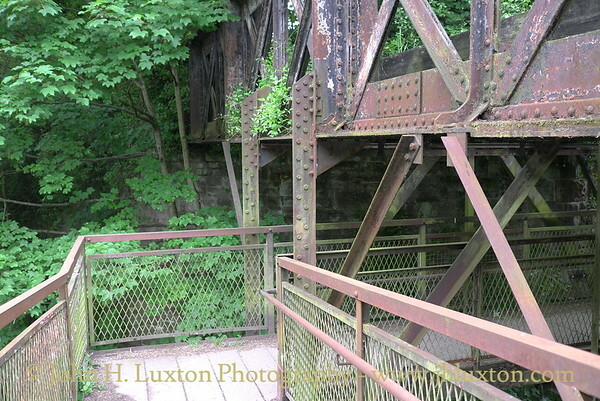 This photograph clearly shows the way the foot bridge passes under the railway on the Redbrook side. Opened on 1st November 1876, the 14-mile Wye Valley Railway crossed the river three times - at Monmouth, Tintern and at Penallt / Redbrook. The latter involved a single-track curved structure of five girder spans, perched on four pairs of cast iron columns. The Penallt Viaduct carried the line for around 300 feet over the England/Wales border between Redbrook Station (Gloucestershire) - noted for its floral displays - and Penallt Halt (Monmouthshire) which opened in 1931 to serve the nearby Penallt village. The Boat Inn sits in the viaduct's shadow. In 1955, a footbridge was added on the west side, of the viaduct offering pedestrians a safe alternative to crossing the river rather than walking along the railway. Four years later, passenger services came to an end and January 6th, 1964 freight services ceased on the Wye Valley line north of Tidenham. The bridge is in need of significant repairs and has been the subject of a recent, but unsuccessful, bid for National Lottery Funding. 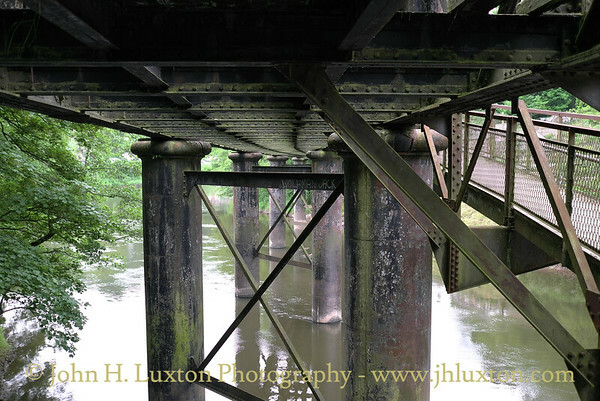 View under the railway deck from the foot bridge underpass. One wonders who "Wolfman Jack" was who managed to apply the graffiti in such an inaccessible place? Opened on 1st November 1876, the 14-mile Wye Valley Railway crossed the river three times - at Monmouth, Tintern and at Penallt / Redbrook. The latter involved a single-track curved structure of five girder spans, perched on four pairs of cast iron columns. The Penallt Viaduct carried the line for around 300 feet over the England/Wales border between Redbrook Station (Gloucestershire) - noted for its floral displays - and Penallt Halt (Monmouthshire) which opened in 1931 to serve the nearby Penallt village. The Boat Inn sits in the viaduct's shadow. In 1955, a footbridge was added on the west side, of the viaduct offering pedestrians a safe alternative to crossing the river rather than walking along the railway. Four years later, passenger services came to an end and January 6th, 1964 freight services ceased on the Wye Valley line north of Tidenham. The bridge is in need of significant repairs and has been the subject of a recent, but unsuccessful, bid for National Lottery Funding. 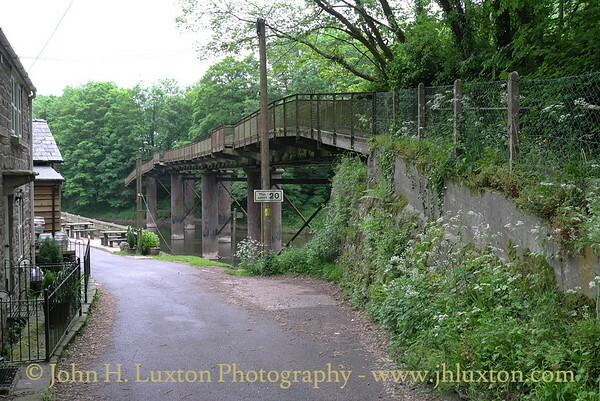 The abutment on the Redbrook / Gloucestershire side. Opened on 1st November 1876, the 14-mile Wye Valley Railway crossed the river three times - at Monmouth, Tintern and at Penallt / Redbrook. The latter involved a single-track curved structure of five girder spans, perched on four pairs of cast iron columns. The Penallt Viaduct carried the line for around 300 feet over the England/Wales border between Redbrook Station (Gloucestershire) - noted for its floral displays - and Penallt Halt (Monmouthshire) which opened in 1931 to serve the nearby Penallt village. The Boat Inn sits in the viaduct's shadow. In 1955, a footbridge was added on the west side, of the viaduct offering pedestrians a safe alternative to crossing the river rather than walking along the railway. Four years later, passenger services came to an end and January 6th, 1964 freight services ceased on the Wye Valley line north of Tidenham. The bridge is in need of significant repairs and has been the subject of a recent, but unsuccessful, bid for National Lottery Funding.